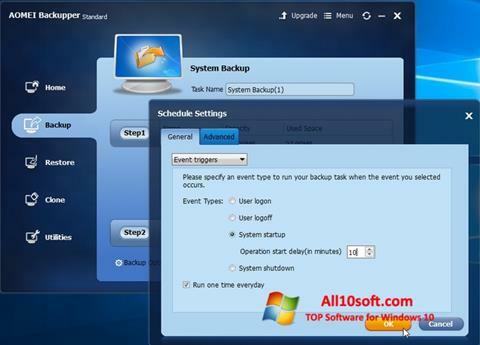 AOMEI Backupper for Windows 10 - data backup tool. The application includes functionality for creating multi-level archives of hard drives, volumes, folders or files, uses tools for preliminary defragmentation of ssd disk partitions, allows you to create incremental images. The utility includes methods for combining and splitting data, expanding existing copies, cataloging them and automatically deleting irrelevant ones. The program can generate bootable media, uses a simple user interface and supports the command line of the OS. You can free download AOMEI Backupper official latest version for Windows 10 in English. Publisher Software: Aomei Technology Co., Ltd.